Earlier today, I made a little fun of an upcoming modern military shooter. I am now going to gush over a modern military shooter. The distinction? The first Medal of Honor (well, the latest one) pitched itself as a "real" military tale. Free of a World War 3 soap opera, it was about some guys fighting a war against other guys. Problem is that "war" was a series of corridors in which you couldn't even walk through a door unless the game said you could. There's a reason Modern Warfare games are full of explosions. It's to distract you from that kind of linearity. 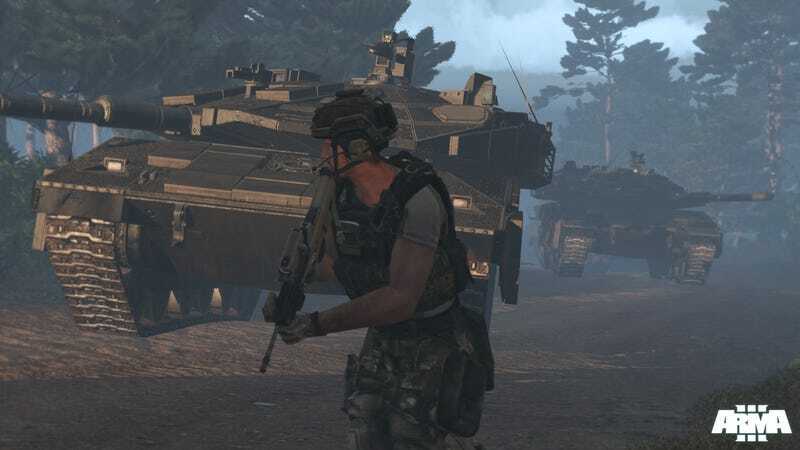 Here, on the other hand, are some screenshots from the upcoming ArmA III by Bohemia Interactive. I couldn't be more excited about this. The last ArmA game, bugs and all, was a blast. Dropping you in an open world where a single bullet could kill you, it was tough, yes, but it also felt real. BI have today released these new screenshots for the game, along with word that after E3 there'll be a community "alpha", with a proper open beta to follow.